Scarlet Tanager by Greg Harber. Join Birmingham Audubon as we debut a new field trip to the beautiful woodlands around Living River, located on the most beautiful bend on the Cahaba River, in search of lingering migrant songbirds and early winter arrivals. Next, we’ll visit the Bibb County Glades Preserve, located on the 480-acre property owned by the Nature Conservancy on the Little Cahaba River. The Kathy Stiles Freeland Bibb County Glades Preserve is home to sixty-one rare plant species and is considered a botanical wonder. The details: We’ll meet at the McDonald’s on US 31 in Hoover, located at 1731 Montgomery Highway (US 31) across from the Galleria. Plan to depart at 7:00 a.m., at which time we’ll caravan and carpool south on I-65 to Exit 234 (Shelby County Airport exit). For anyone planning to meet us at Living River, here is a link to their driving directions. As always, you’ll also want to bring plenty of water and snacks, insect repellent, rain gear, sunblock, and seasonally appropriate attire. Since part of this trip involves a moderate walk through the woods, comfortable shoes are a must. The birds: We can expect to see an assortment of vireos, warblers, and woodpeckers. 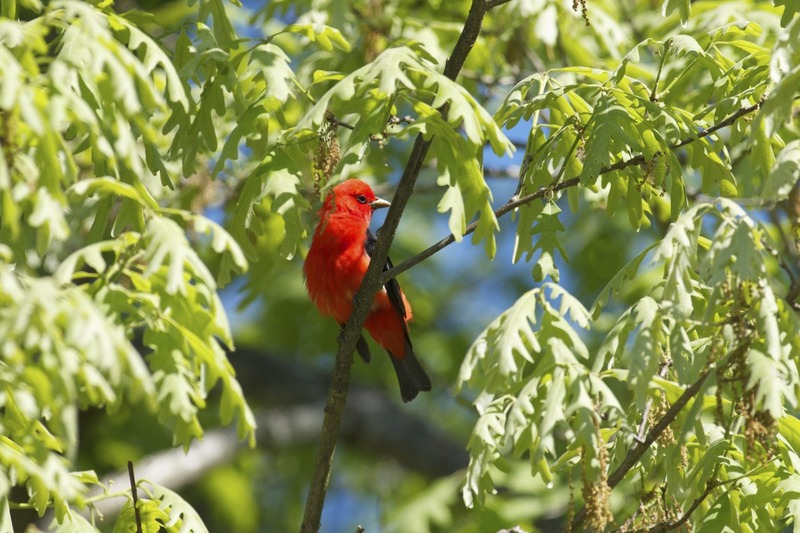 Scarlet Tanagers and Blue-gray Gnatcatchers are a possibility, along with various wading birds on the banks of the Little Cahaba. We might see an early winter arrival like Yellow-rumped Warblers and White-throated Sparrows. Click here for the Alabama Birding Trail site for Bibb County Glades Preserve and here for the most recent eBird checklist. You can check out the most recent eBird checklist for Living River here. Trip leaders: Matt Hunter and Linda Neighbors lead this trip; his cell is 205-915-8186, and her cell is 205-568-5554 (day of field trip only). For more information, email the Outreach & Communications Director.